As the home of the President of the United States of America, the White House is regarded around the world as a symbol of western democracy and the home of American politics. Here are ten facts about the White House. The White House's address is 1600 Pennsylvania Avenue, Washington DC. On 1st November 1800, President John Adams became the first President to move into the newly-built White House. Work to build the house began in 1792 and most of the work was carried out by slaves and immigrants. Despite being the home of the American President since 1800, the White House didn't officially get its name until 1901. Although it had been referred to as the White House as early as 1811, it had also been known as “President's Palace”, “President's House” and the “Executive Mansion”. President Roosevelt was the first president to officially call his rather grand pad the White House-Washington when he had this name engraved on presidential stationary from 1901. When the President is wanting to unwind from a hard day's work running a country or if he just wants to show off, he is able to use the White House's tennis court, jogging track, swimming pool, cinema, putting green and bowling lane. 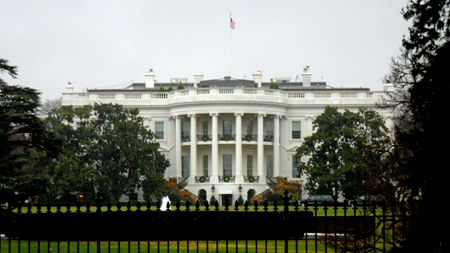 The White House is actually five times smaller than it was originally intended to be. It cost just over $230,000 to build, which is equivalent to approximately $2.5 million dollars today. The White House was almost destroyed by the British Army in 1814 during the War of 1812 (they must have been two years late for the war!). The interior of the building was burnt out and the exterior also suffered extensive damage and had to be torn down and rebuilt. The house was ready for President James Monroe to move back into in October 1817 although work continued on it for several more years. Major renovation work had to be carried out on the White House in the late 1940s and early 1950s after it was feared that the building was on the verge of collapse. This was caused by its original timber frame and sandstone brick structure not being able to cope with various additions to the building over the years. Between 1949 and 1951, President Truman lived across the road in Blair House while the renovations took place. This basically involved rebuilding the White House from the inside, taking out the interior rooms and replacing the timber structure with a tougher steel frame and then reconstruction of the original rooms. Also added during the renovation was air conditioning, storage areas and a bomb shelter. From its original completion in 1800 and up to the early part of the Twentieth Century, the White House was open to the public. This resulted in some rowdy behaviour, especially after the swearing-in ceremonies of newly elected/re-elected Presidents. One example is in 1829 when President Andrew Jackson had to leave the White House to go to a hotel while the 20,000 revellers in his home were lured out of it by bathtubs filled with whiskey and orange juice. Public tours of the White House were allowed by President Jefferson, and have only been suspended during wartime and for two years after September 11th 2001. Nowadays the White House can only be visited by pre-arranged public tours. Every Christmas, the First Lady comes up with a theme for the White House Christmas Tree. 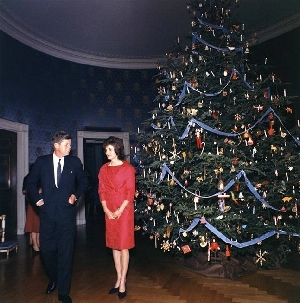 This tradition began when Jacqueline Kennedy decided on a “Nutcracker Suite” theme for the tree in 1961 (pictured right). Every year since 1966, the White House Christmas Tree has been donated by a member of the National Christmas Tree Association and is displayed in the Blue Room. Decorations relating to the year's theme for the tree are made by American artisans. The first time electric lights were used on a White House Christmas Tree was in 1895. President Grover Cleveland is the only President to have had a wedding in The White House. He married Frances Folsom in the Blue Room of the White House on June 2nd 1886. At the age of twenty-one, Frances was the youngest First Lady, a record still held to this day. Incidentally, and not really related to facts about the White House, Grover Cleveland is the only President to have served two non-consecutive terms in office.